Action! 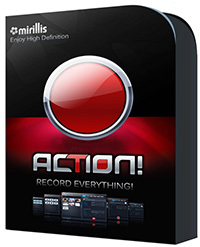 defines a new standard of performance and user experience for real-time desktop recording software. Record smooth high framerate HD videos of your dekstop and applications activity, add microphone audio commentary and create great tutorials with ease! Record videos from websites and other applications in real-time. Action! allows to record videos from defined display region, selected application window or in fullscreen mode. With Action! you can record videos from ANY web player, no matter which video service you are using! Action! allows to record additional live audio commentary during gameplay or dekstop recording making easy creation of tutorials and game walk-through videos. Microphone settings provide full control of microphone input volume and mixing level with system sounds. Audio recording function allows to record all sounds, music and game audio. Using microphone you can easily create podcasts. Additionaly Action! can encode in real-time the recorded audio in M4A format, making the recorded audio files small and compact.